[UPDATED] The rain is drizzling on this warm winter day. 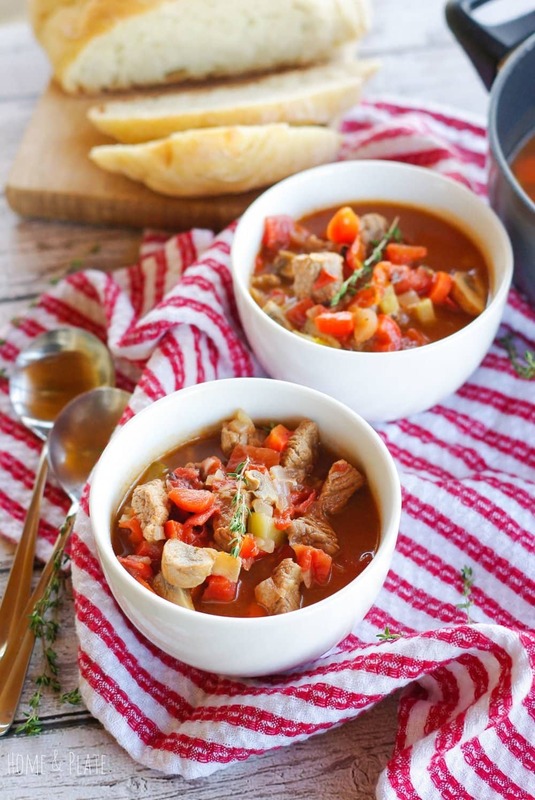 Winter is the perfect reason to stay indoors and make up a pot of hearty winter beef stew to enjoy for dinner. It’s simple yet fulfilling. 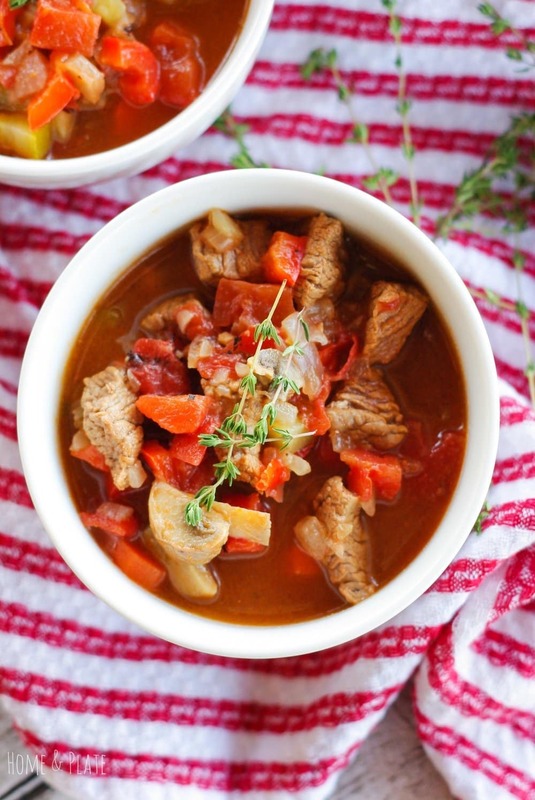 Full of veggies, this hearty winter beef stew is satisfying and delicious. 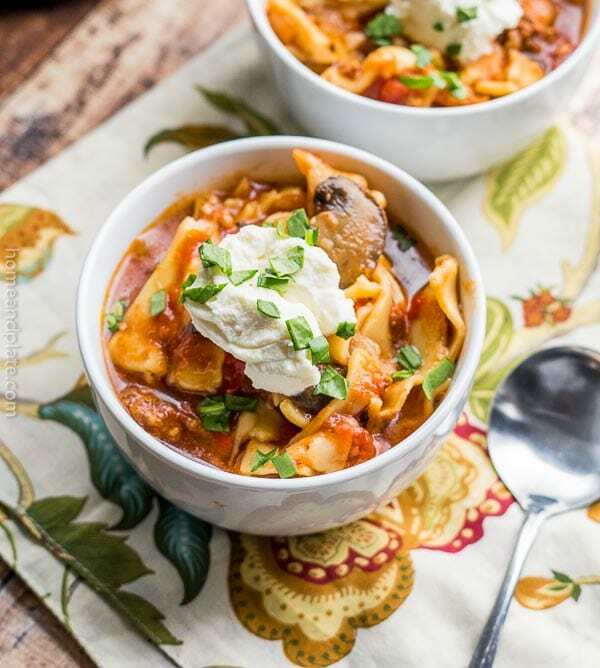 This soup is perfect for warmer winter weather or cold and snowy temps. Just grab whatever vegetables you have in the refrigerator. It’s that easy! Sauté sweet onion, brown the stew beef and add the rest of the ingredients and let it slow simmer for a few hours. The result is fork-tender beef with incredible flavor. Pick up a package of “beef for stew” at the grocery store. I usually trim the chunks again into smaller bite sized pieces and let it marinate in Italian dressing for extra flavor for about a half hour before starting the stew. This easy dinner is a breeze to make on the stove top or the crockpot. If using a crock pot, sauté your onions and beef on the stove and transfer to the crockpot to cook on low for four hours. For either method, slow and low is how you do it. 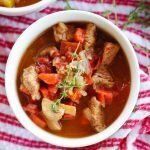 What veggies should I use in this stew? My kids love green beans and carrots, my husband requested sweet bell peppers and I am a fan of zucchini. Lucky for me I had all those veggies in the fridge. This recipe is also delicious with chunks of potatoes. I try to make a big pot so there is plenty for leftovers. This stew freezes well too. Need a quick dinner? 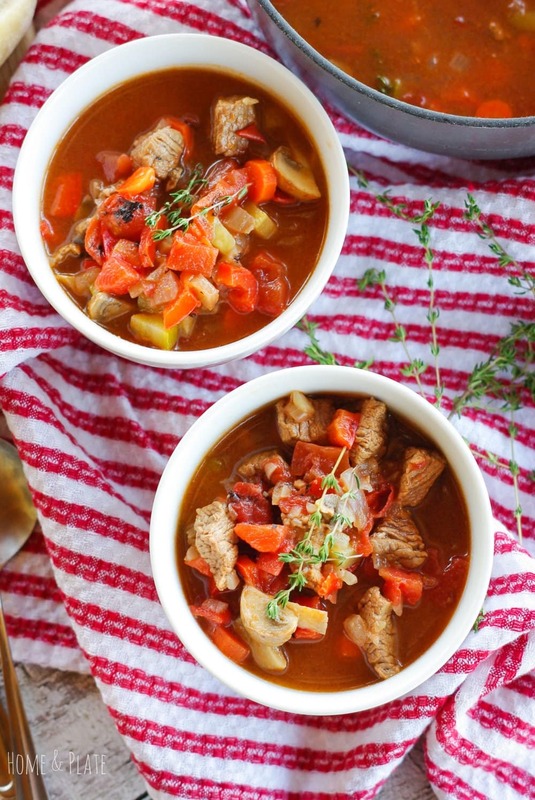 Grab this stew out of the freezer, heat and eat! 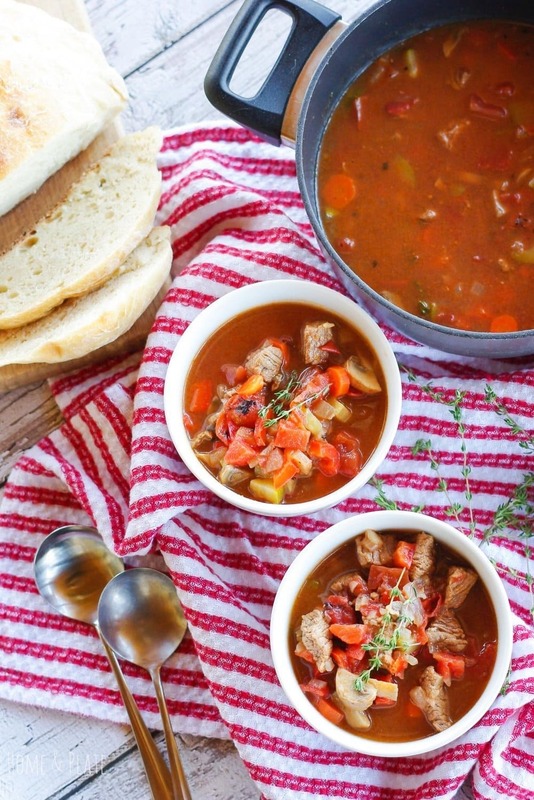 My No Knead Dutch Oven Crusty Bread is the perfect artisan loaf to serve alongside this beef stew. In a large stockpot, add the stew meat and let the beef marinate in the dressing for about 30 minutes. Next, brown the beef and onion over medium high heat. Add the remaining vegetables and soften for a minute. Add the tomatoes and the broth and stir until mixed. Continue to cook on low heat for two hours covered. 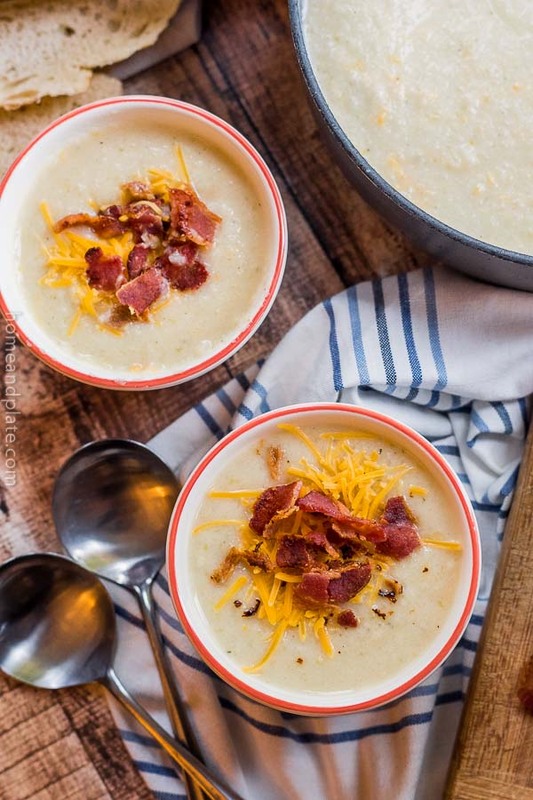 This looks like the perfect winter meal! Yum! I can almost smell it. Thanks so much. The soup is a perfect way to warm up on a winters day. Thanks so much. The veggies bring out the flavor and it gets better the second day. Such beautiful photos of this classic winter dish! Very nice Ali! Thanks so much Beth. Colorful and delicious.